Romanian Review of Geographical Education is the journal of the Department of Exact Sciences of the Faculty of Psychology and Sciences of Education and of the Department of Regional Geography and Territorial Planning of “Babeş-Bolyai” University, Cluj-Napoca, ROMANIA. It has two issues per year. 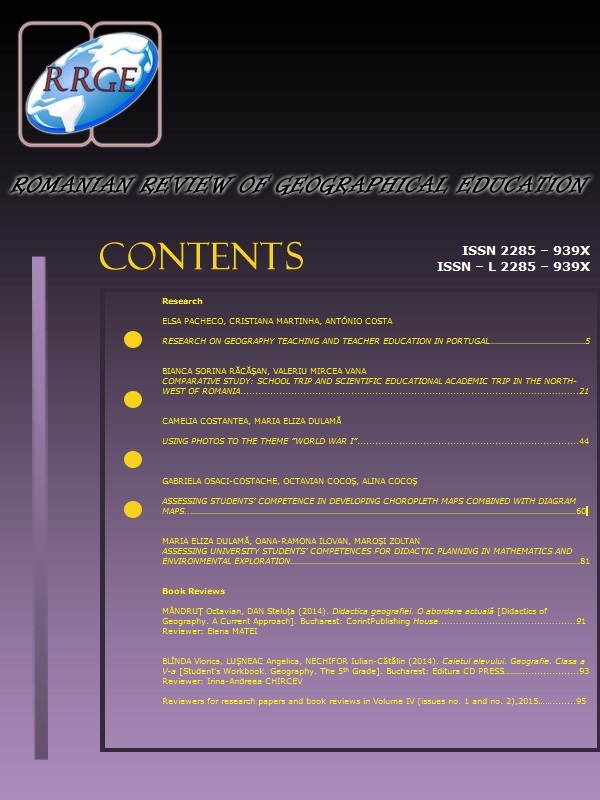 Romanian Review of Geographical Education is an open access and free of charge publication that provides access to all the papers published in all issues, in order to support a greater global exchange of geographical education knowledge to all specialists in the field. In general open access means “available freely to the public via the Internet”, which the Budapest Open Access Initiative defines as “permitting any users to read, download, copy, distribute, print, search, or link to the full texts of these articles, crawl them for indexing, pass them as data to software, or use them for any other lawful purpose, without financial, legal, or technical barriers other than those inseparable from gaining access to the internet itself” (UMD Libraries, 2014). Our journal hosts scientific papers on results of original empirical and theoretical research on geographical education as well as book reviews in the field of the Didactics of Geography. The aim of this journal is to promote best practice in teaching and learning Geography. It offers specialists and practitioners within the educational system the possibility of sharing their best practice experience in teaching. The journal is open to practitioners and researchers from the pre-university and university systems of education, interested in realising quality interactive teaching activities.